Beltane (pronounced /ˈbɛltən/) is the anglicized spelling of Bealtaine or Bealltainn, the Gaelic names for either the month of May or the festival that takes place on the first day of May. In Irish Gaelic the month of May is known as Mí Bealtaine or Bealtaine and the festival as Lá Bealtaine ('day of Bealtaine' or, 'May Day'). In Scottish Gaelic the month is known as either (An) Cèitean or a' Mhàigh, and the festival is known as Latha Bealltainn or simply Bealltainn. The feast was also known as Céad Shamhain or Cétshamhainin from which the word Céitean derives. As an ancient Gaelic festival, Beltane was celebrated in Ireland, Scotland, and the Isle of Man. There were similar festivals held at the same time in the other Celtic countries of Wales, Brittany, and Cornwall. Beltane was one of four Gaelic seasonal festivals: Samhain, Imbolc, Beltane, and Lughnasadh. Beltane (the beginning of summer) and Samhain (the beginning of winter) are thought to have been the most important. The festival survives in folkloric practices in the Celtic Nations and the diaspora, and has experienced a degree of revival since the late twentieth century. Since the early twentieth century it has been commonly accepted that Old Irish Beltaine is derived from a Common Celtic *belo-te(p)niâ, meaning "bright fire." The element *belo- might be cognate with the English word bale (as in 'bale-fire') meaning 'white' or 'shining'; compare Old English bael, and Lithuanian/Latvian baltas/balts, found in the name of the Baltic; in Slavic languages byelo or beloye also means 'white', as in Беларусь (White Russia or Belarus) or Бе́лое мо́ре (White Sea). A more recent etymology by Xavier Delamarre suggests it derives from a Common Celtic *Beltinijā, cognate with the name of the Lithuanian goddess of death Giltinė, the root of both being Proto-Indo-European *gʷelH- ("suffering, death"). Beltane is a cross-quarter day, marking the midpoint in the Sun's progress between the spring equinox and summer solstice. Since the Celtic year was based on both lunar and solar cycles, it is possible that the holiday was celebrated on the full moon nearest the midpoint between the spring equinox and the summer solstice. The astronomical date for this midpoint is closer to May 5th or May 7th, but this can vary from year to year. Beltane was one of four Gaelic seasonal festivals: Samhain (~1 November), Imbolc (~1 February), Beltane (~1 May), and Lughnasadh (~1 August). Beltane (the beginning of summer) and Samhain (the beginning of winter) are thought to have been the most important of the four. Sir James George Frazer wrote in The Golden Bough: A Study in Magic and Religion that the times of Beltane and Samhain are of little importance to European crop-growers, but of great importance to herdsmen. Thus, he suggests that halving the year at the beginning May and November dates from a time when the Celts were mainly a pastoral people, dependent on their herds. The earliest mention of Beltane is in Old Irish literature from Gaelic Ireland. According to the early medieval texts Sanas Cormaic and Tochmarc Emire, Beltane was held on May 1st and marked the beginning of summer. The texts say that, to protect cattle from disease, the druids would make two fires "with great incantations" and drive the cattle between them. In Irish mythology, the beginning of the summer season for the Tuatha Dé Danann and the Milesians started at Beltane. Great bonfires would mark a time of purification and transition, heralding in the season in the hope of a good harvest later in the year, and were accompanied with ritual acts to protect the people from any harm by Otherworldly spirits, such as the Aos Sí. Like the festival of Samhain, celebrated on October 31st which is the opposite position in the year, Beltane was a time when the Otherworld was seen as particularly close at hand. For the Celts, Beltane marked the beginning of the pastoral summer season when the herds of livestock were driven out to the summer pastures and mountain grazing lands. Rituals were held at that time to protect them from harm, both natural and supernatural, and this mainly involved the "symbolic use of fire." There were also rituals to protect crops, dairy products, and people, and to encourage growth. The sí (often described as 'the spirits' or 'the fairies') were thought to be especially active at Beltane (as at Samhain) and the goal of many Beltane rituals was to appease the sí. Beltaine was a "spring time festival of optimism" during which "fertility ritual again was important, perhaps connecting with the waxing power of the sun." The lighting of bonfires on Oidhche Bhealtaine (the eve of Bealtaine) on mountains and hills of ritual and political significance was one of the main activities of the festival. Early Gaelic sources from around the tenth century state that the druids of the community would create a need-fire on top of a hill on this day and drive the village's cattle through the fires to purify them and bring luck (Eadar dà theine Bhealltainn in Scottish Gaelic, 'Between two fires of Beltane'). This term is also found in Irish and is used as a turn of phrase to describe a situation which is difficult to escape from. In Scotland, boughs of juniper were sometimes thrown on the fires to add an additional element of purification and blessing to the smoke. People would also pass between the two fires to purify themselves. This was echoed throughout history after Christianization, with lay people instead of Druid priests creating the need-fire. The festival persisted widely up until the 1950s, and in some places the celebration of Beltane continues today. According to seventeenth century historian Geoffrey Keating, there was a great gathering at the hill of Uisneach each Beltane in medieval Ireland, where a sacrifice was made to a god named Beil. Keating wrote that two bonfires would be lit in every district of Ireland, and cattle would be driven between them to protect them from disease. Excavations at Uisneach in the twentieth century found evidence of large fires and charred bones, showing it to have been ritually significant. Bonfires continued to be a key part of the festival, and were generally lit on mountains and hills. In the nineteenth century, for example, John Ramsay described Scottish Highlanders kindling a need-fire or force-fire at Beltane. Such a fire was deemed sacred. In the nineteenth century, the ritual of driving cattle between two fires—as described in Sanas Cormaic almost 1000 years before—was still practiced across most of Ireland and in parts of Scotland. Sometimes the cattle would be driven around a bonfire or be made to leap over flames or embers. The people themselves would do likewise. In the Isle of Man, people ensured that the smoke blew over them and their cattle. In County Dublin, the skull and bones of a horse were burnt on the bonfires. On Beltane Eve, all hearth fires and candles would be doused and, at the end of the festival, they would be re-lit from the Beltane bonfire. When the bonfire had died down, its ashes were thrown among the sprouting crops. From these rituals, it is clear that the fire was seen as having protective powers. Similar rituals were part of May Day, Midsummer, or Easter customs in other parts of the British Isles and mainland Europe. According to Frazer, the fire rituals are a kind of imitative or sympathetic magic. According to one theory, they were meant to mimic the Sun and to "ensure a needful supply of sunshine for men, animals, and plants." According to another, they were meant to symbolically "burn up and destroy all harmful influences." In the Scottish Highlands, food was cooked at the bonfire following certain rituals. In 1769, Thomas Pennant wrote that, in Perthshire, a caudle made from eggs, butter, oatmeal, and milk was cooked on the bonfire. Some of the mixture was poured on the ground as a libation. Everyone present would then take an oatmeal cake. A piece was offered to the spirits to protect their livestock (one piece to protect the horses, one to protect the sheep, and so forth) and a piece was offered to each of the animals that might harm their livestock (one to the fox, one to the eagle, and so forth). Afterwards, they would drink the caudle. Another common aspect of the festival which survived up until the early twentieth century was the hanging of May Boughs on the doors and windows of houses and the erection of May Bushes in farmyards, which usually consisted either of a branch of rowan/caorthann (mountain ash) or more commonly whitethorn/sceach geal (hawthorn) which is in bloom at the time and is commonly called the 'May Bush' or just 'May' in Hiberno-English. Furze/aiteann was also used for the May Boughs, May Bushes and as fuel for the bonfire. The May Bush was popular in parts of Ireland until the late nineteenth century. This was small tree, typically a thorn tree, that would be decorated with bright flowers, ribbons, painted shells, and so forth. There were household May Bushes (which would be set outside each house) and communal May Bushes (which would be set in a public spot or paraded around the neighborhood). In Dublin and Belfast, May Bushes were brought into town from the countryside and decorated by the whole neighborhood. In some places, it was customary to dance around the May Bush, and at the end of the festivities it was burned in the bonfire. The practice of decorating the May Bush or Dos Bhealtaine with flowers, ribbons, garlands, and colored egg shells has survived to some extent among the diaspora as well, most notably in Newfoundland, and in some Easter traditions observed on the East Coast of the United States. Yellow flowers such as primrose, rowan, hawthorn, gorse, hazel, and marsh marigold were set at doorways and windows in nineteenth century Ireland, Scotland, and Mann. Sometimes loose flowers were strewn at the doors and windows and sometimes they would be made into flower bouquets, garlands, or crosses and fastened to them. They would also be fastened to cows and equipment for milking and butter making. It is likely that such flowers were used because they evoked fire. Similar May Day customs are found across Europe. Thorn trees were seen as special trees and were associated with the sí or fairies. The custom of decorating a May Bush or May Tree was found in many parts of Europe. Frazer believed that such customs are a relic of tree worship: "The intention of these customs is to bring home to the village, and to each house, the blessings which the tree-spirit has in its power to bestow." Sharon MacLeod wrote that May Bushes were set outside farmhouses "to encourage and protect the abundance of milk during the summer." Holy wells were often visited at Beltane, as well as at the other Gaelic festivals of Imbolc and Lughnasadh. Visitors to holy wells would pray for health while walking "sunwise" (moving from east to west) around the well. They would then leave offerings; typically coins or clooties (strips of cloth or rags). The first water drawn from a well on Beltane was seen as being especially potent, as was Beltane morning dew. At dawn on Beltane, maidens would roll in the dew or wash their faces with it. It would also be collected in a jar, left in the sunlight, and then filtered. The dew was thought to maintain youthfulness, increase sexual attractiveness, and help with skin ailments. People also took steps specifically to ward-off or allay the sí (who are often likened to fairies). This included turning one's clothing inside-out, carrying iron or salt, and leaving small offerings at the doorstep or at places associated with the sí. In Ireland, cattle would be brought to 'fairy forts' and bled. The owners would taste the blood and then pour it into the earth with prayers for the herd's safety. Sometimes the blood would be left to dry and then be burned. To protect farm produce and encourage fertility, farmers would lead a procession around the boundaries of their farm. They would "carry with them seeds of grain, implements of husbandry, the first well water, and the herb vervain (or rowan as a substitute). The procession generally stopped at the four cardinal points of the compass, beginning in the east, and rituals were performed in each of the four directions." The bonfire lit on Calton Hill, Edinburgh, to welcome Beltane morning, 2008. As a festival, Beltane had largely died out by the mid-twentieth century, although some of its customs continued. The lighting of a community Beltane fire from which each hearth fire is then relit is observed today in some parts of the Gaelic diaspora, though in most of these cases it is a cultural revival rather than an unbroken survival of the ancient tradition. In some areas of Newfoundland, the custom of decorating the May Bush is also still extant. The town of Peebles in the Scottish Borders holds a traditional week-long "Beltane Fair" every year in June, when a local girl is crowned Beltane Queen on the steps of the parish church. Like other Borders festivals, it incorporates a Common Riding. Since 1988, a Beltane Fire Festival has been held every year during the night of 30 April on Calton Hill in Edinburgh, Scotland. While inspired by traditional Beltane, this festival is a modern arts and cultural event which incorporates myth and drama from a variety of world cultures and diverse literary sources. The Wheel of the Year in the Northern Hemisphere. In the Southern Hemisphere these festivals are commonly shifted by six months to match the local seasons. The Wheel of the Year is a Wiccan and Neopagan term for the annual cycle of the Earth's seasons. It consists of eight festivals, spaced at approximately even intervals throughout the year. These festivals are referred to by Wiccans as Sabbats. Beltane is observed by Neopagans in various forms, and by a variety of names. Some celebrate in a manner as close as possible to how the Ancient Celts and Living Celtic cultures have maintained the traditions, while others observe the holiday with rituals taken from numerous other unrelated sources, Celtic culture being only one of the sources used. Wiccans and Wiccan-inspired Neopagans celebrate a variation of Beltane as a sabbat, one of the eight solar holidays. Although the holiday may use features of the Gaelic Bealtaine, such as the bonfire, it bears more relation to the Germanic May Day festival, both in its significance (focusing on fertility) and its rituals (such as maypole dancing). Some Wiccans celebrate Beltane by enacting the marriage of the May Lord and Lady with maypoles and bonfires. Among the Wiccan sabbats, Beltane is a cross-quarter day; it is celebrated in the northern hemisphere on May 1 and in the southern hemisphere on November 1. Beltane follows Ostara and precedes Midsummer. Celtic Reconstructionists usually celebrate Lá Bealtaine when the local hawthorn trees are in bloom, or on the full moon that falls closest to this event. Many observe the traditional bonfire rites, to whatever extent this is feasible where they live, including the dousing of the household hearth flame and relighting of it from the community festival fire. Some decorate May Bushes and prepare traditional festival foods. Pilgrimages to holy wells are traditional at this time, and offerings and prayers to the spirits or deities of the wells are usually part of this practice. Crafts such as the making of equal-armed rowan crosses are common, and often part of rituals performed for the blessing and protection of the household and land. 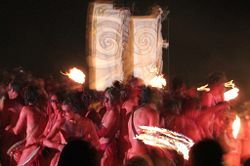 The burning Phoenix and sprites at the Beltane Fire Festival. The Beltane Fire Festival is an annual participatory arts event and ritual drama, held on April 30 on Calton Hill in Edinburgh, Scotland. It is inspired by the ancient Gaelic festival of Beltane which marked the beginning of summer. The modern festival was started in 1988 by a small group of enthusiasts, with academic support from the School of Scottish Studies at the University of Edinburgh. Since then the festival has grown, with an audience of over ten thousand people sharing the spectacular procession. Originally intended to take place on Arthur's Seat, the home of earlier Edinburgh Beltane celebrations, for practical reasons the location was moved to Calton Hill. While the festival draws on a variety of historical, mythological and literary influences, the organizers do not claim it to be anything other than "a modern celebration of Beltane," evolving with its participants. The main event of the festival is the Procession of the May Queen around the Hill, starting at the Acropolis (National Monument). Participants in the procession perform a ritual drama loosely based on some aspects of the pre-Christian festival of Beltane, and other mythologies from ancient cultures. Key elements include the death and rebirth of Green Man, and the lighting of the bonfire. ↑ Xavier Delamarre, Dictionnaire de la langue gauloise (Paris:Editions Errance, 2008, ISBN 978-2877723695). ↑ 2.0 2.1 Michael Dames, Mythic Ireland (London: Thames & Hudson, 1996, ISBN 978-0500278727). ↑ 3.0 3.1 3.2 James George Frazer, The Golden Bough: A Study in Magic and Religion (Suzeteo Enterprises, 2012, ISBN 978-1936830459). ↑ Kuno Meyer (ed. ), Sanas Cormaic: Cormac's Glossary (Llanerch Press, 1994, ISBN 978-1897853269). ↑ 5.0 5.1 5.2 5.3 5.4 5.5 5.6 5.7 5.8 5.9 Ronald Hutton, The Stations Of The Sun (Oxford University Press, 2001, ISBN 978-0192854483). ↑ 6.0 6.1 6.2 6.3 6.4 6.5 6.6 6.7 6.8 6.9 Patricia Monaghan, The Encyclopedia of Celtic Mythology and Folklore (Checkmark Books, 2008, ISBN 978-0816075560). ↑ 7.0 7.1 7.2 John T. Koch, Celtic Culture: A Historical Encyclopedia (ABC-CLIO, 2005, ISBN 978-1851094400). ↑ 8.0 8.1 8.2 Nora Chadwick, The Celts (Penguin, 1981, ISBN 978-0140212112). ↑ 9.0 9.1 9.2 9.3 Kevin Danaher, The Year in Ireland (Dublin: Mercier, 1971, ISBN 978-1856350938). ↑ 10.0 10.1 James MacKillop, Dictionary of Celtic Mythology (Oxford University Press, 2000, ISBN 978-0192801203). ↑ John Gregorson Campbell, The Gaelic Otherworld (Edinburgh, Birlinn Ltd., 2005, ISBN 978-1841582078). ↑ Geoffrey Keating, The History of Ireland Translated by David Comyn and Patrick S. Dinneen. CELT: Corpus of Electronic Texts. Retrieved December 23, 2013. ↑ Nerys T. Patterson, Cattle Lords and Clansmen: The Social Structure of Early Ireland (University of Notre Dame Press, 1994, ISBN 978-0268008000). ↑ 14.0 14.1 Katharine Clark, An Irish Book of Shadows (Galde Press, 2001, ISBN 978-1880090992). ↑ 15.0 15.1 15.2 15.3 Sharon Paice MacLeod, Celtic Myth and Religion (McFarland, 2011, ISBN 978-0786464760). ↑ F. Marian McNeill, Silver Bough: Calendar of Scottish National Festivals, Vols. 1-4 (Glasgow: Stuart Titles Ltd, 1990, ISBN 978-0948474040). ↑ The May Bush in Newfoundland. Retrieved December 17, 2013. ↑ The History of Peebles Beltane Festival. Retrieved December 17, 2013. ↑ Beltane Fire Society The building blocks of a festival - Beltane Fire Society. Retrieved December 17, 2013. ↑ Margot Adler, Drawing Down the Moon (Boston, MA: Beacon Press, 1987, ISBN 978-0807032374). ↑ Starhawk, The Spiral Dance: A Rebirth of the Ancient Religion of the Great Goddess (New York, NY: Harper and Row, 1989, ISBN 978-0062508140). ↑ Isaac Bonewits, Bonewits's Essential Guide to Druidism (New York, NY: Citadel Press Inc., 2006, ISBN 978-0806527109). ↑ Elizabeth Healy, In Search of Ireland's Holy Wells (Merlin Publishing, 2001, ISBN 978-0863278655). ↑ A Detailed History of Beltane, Beltane Fire Society. Retrieved December 17, 2013. ↑ Beltane Fire Society Retrieved December 27, 2013. This page was last modified on 13 December 2016, at 17:49.